Something to think about making with your fresh strawberries… since the strawberry season has been in full swing I have been busy making fresh ice cream and shortcake for the grandkids, pies for Kenny and jam for the market. 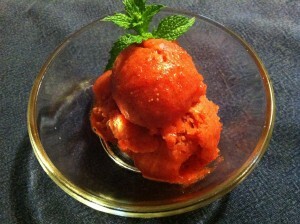 I decided to freeze some for the winter and thought about making some sorbet for myself. This winter I tried a new jam recipe, Strawberry Balsamic, and it was absolutely wonderful. I haven’t been able to keep it in stock since making the first batch. I looked at a few recipes and wasn’t to impressed with them, then I thought what about adding some Balsamic vinegar…the jam tasted so good. This is totally awesome, wouldn’t make it any other way from now on. Combine the sugar and water together and cook in a saucepan on medium until the sugar dissolves. Cool. In a bowl combine the strawberries, vinegar and 1 tablespoon of sugar. Let macerate for 30 minutes. In a blender puree the macerated strawberries with the sugar syrup. Return the puree to the bowl and chill through. Add the chilled mixture into an ice cream maker and freeze according to instructions.